After originally meeting in their late teens, Sarah and Dan crossed paths again seven years later – with the help of Sarah's best friend. “She invited both of us to her barbecue and forgot to mention that it was actually a blind date!” Sarah recalls. “Shortly after the introductions, we were given the task of building the new barbecue together. I wouldn't say we hit it off straightaway, as neither of us is particularly DIY-savvy, so it ended up having a wonky leg and both of us refusing to take responsibility.” Though a little contrived, the ice was broken and the rest is history. One sunny September evening in 2013, Dan took Sarah out for dinner followed by a stroll around the marina in Cardiff bay. To Sarah's surprise, he then got down on one knee and asked her to marry him. Keen to tie the knot, the pair booked their wedding for nine months' time. 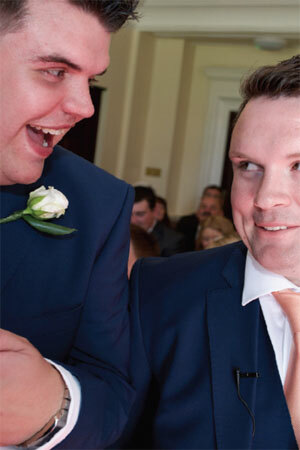 “We fell in love with the venue and didn't want to wait. 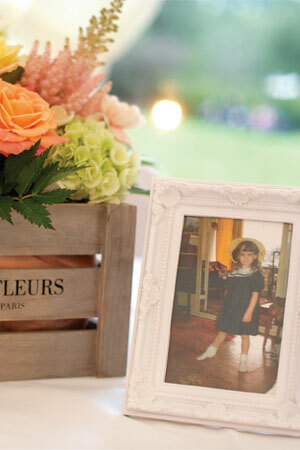 The whole wedding took us about a month to organise,” says Sarah. Sarah and Dan had no troubles choosing who they wanted in their bridal party, and with that decision made, they got planning. We visited the venue two weeks after we got engaged and both fell in love with its grounds, rustic feel and the fact the hotel was exclusively ours for the day. The staff were brilliant, they were in constant contact and nothing was too much trouble. Dan's friend of 12 years Nathan was his best man and my brother James, Dan's cousin Rhys, and friends Anthony and Huw were his ushers. 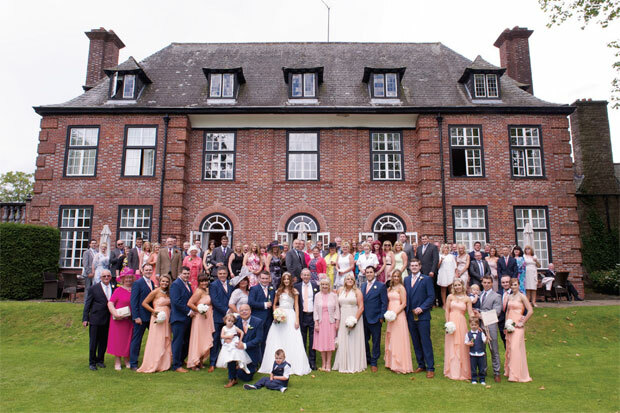 They all wore navy three-piece suits with peach ties – they left it to the week before the wedding to sort and went to one shop! I felt like a glamorous version of my usual self on the day. Hayley Armstrong did my hair, which I accessorised with a Glitzy Secrets tiara. My make-up was by Alex Gallop and after my trial I knew she would fit in well with all the girls on My mum's a big Great British Bake Off fan and came up with the idea the morning. I tried on more than 20 dresses before finding the one – or two in my case. I wanted something quite princess-like for the day and a more glamorous style for the evening. My first dress, by Victoria Jane, was lovely and light and once we adjusted the straps to be off the shoulder, I knew it was me. I had a selection of seasonal flowers, roses, peonies and my favourite gerberas in my bouquet, the table centrepieces and other floral arrangements too. 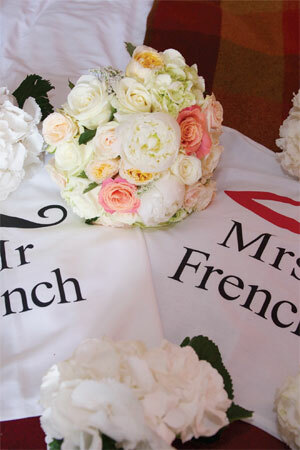 Our florist was brilliant – she offered suggestions of how to recreate ideas I'd seen to our budget. 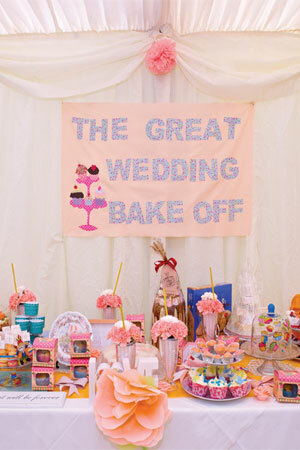 Rag garlands, pompoms, vintage frames with childhood photographs, crates filled with flowers, chair bows and the odd gnome – I love gnomes – decorated our venue. We also had a candy buffet. 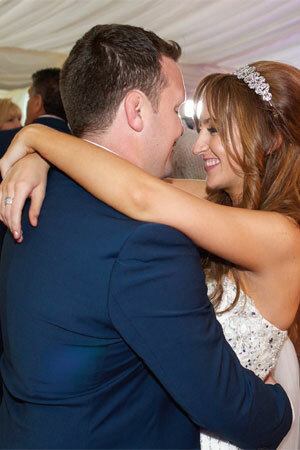 SARAH'S TOP TIP: Have the wedding that you and your partner want. It's ultimately you who'll cherish the memories of that day forever. My mum's a big Great British Bake Off fan and came up with the idea that we ask our wedding guests to bake a cake and bring it along. I loved the effort everyone made. 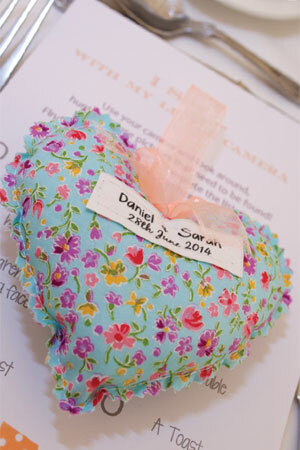 Our wedding favours were personalised hearts. 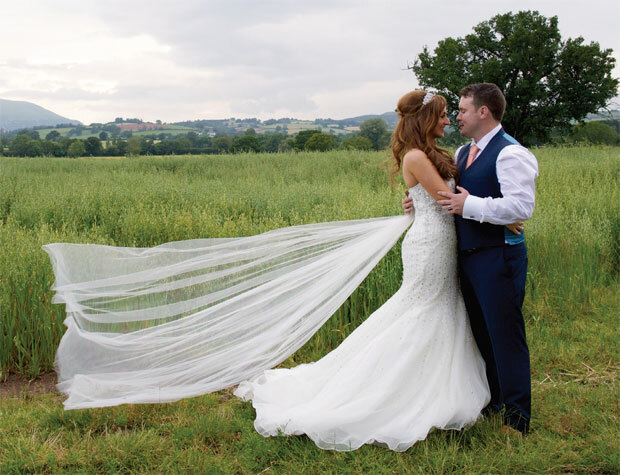 When I described to Danielle at Miss Darcy Bridal Boutique what I was looking for as my second gown, she knew just the dress by Madeline Gardner. It was comfortable enough to dance in and its detachable train added an extra bit of glam. 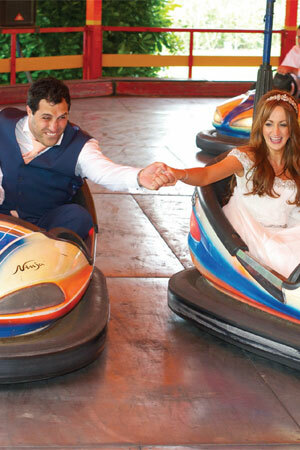 For a bit of fun on the day, we booked dodgems through our venue, which people still talk about now, lawn games and mini golf, a surprise gift for Dan as he's a big golfing fan. We met our photographers Gail and John at a wedding fair in St Pierre; straightaway we both felt relaxed and loved their passion and original ideas. They brought card and pens with them on the day and invited guests to write a message and have their photo taken with it. We didn't know until we received the prints what any of these said.